Using the Swift Satellite Observatory, scientists reveal what was likely the most luminous white dwarf eruption ever seen. Astronomers have today announced that they have discovered possibly the most luminous ‘new star’ ever – a nova discovered in the direction of one of our closest neighboring galaxies: The Small Magellanic Cloud. Astronomers from the University of Leicester contributed to the discovery by using the Swift satellite observatory to help understand what was likely the most luminous white dwarf eruption ever seen. A nova happens when an old star erupts dramatically back to life. In a close binary star system consisting of a white dwarf and a Sun-like companion star, material is transferred from the companion to the white dwarf, gradually building up until it reaches a critical pressure. Then uncontrolled nuclear burning occurs, leading to a sudden and huge increase in brightness. It is called a nova because it appeared to be a new star to the ancients. Novae are usually found in visible light, but often go on to emit higher energy X-rays as well. Together, these different datasets provide information on the white dwarf, such as its temperature and chemical composition. Using telescopes from South Africa to Australia to South America, as well as the orbiting Swift observatory, a team led by the South African Astronomical Observatory has revealed that the nova SMCN 2016-10a, which was discovered on 14th October 2016, is the most luminous nova ever discovered in the SMC, and one of the brightest ever seen in any galaxy. The observations that they made are the most comprehensive ever for a nova in this galaxy. The SMC, 200,000 light-years away, is one of our closest companion galaxies; it is a dwarf galaxy, very much less massive than our own. 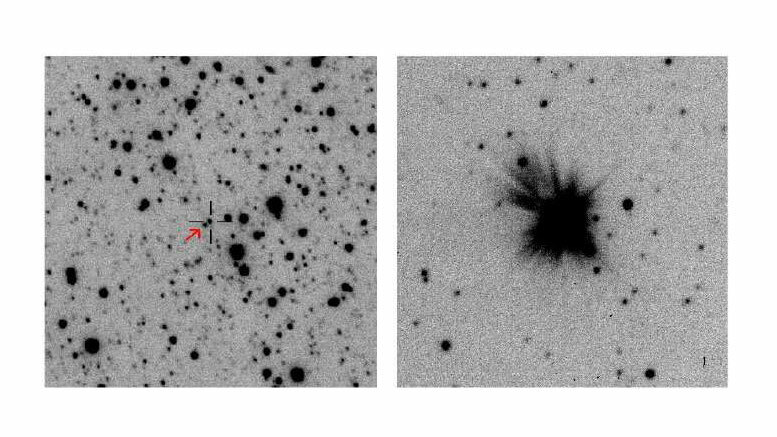 Novae occur frequently in our Galaxy, with a rate of around 35 each year, but SMCN 2016-10a is the first nova to have been detected in the SMC since 2012. Dr Kim Page, a member of the Swift team at the University of Leicester, led the X-ray analysis, while Paul Kuin, from the Mullard Space Science Laboratory, University College London, organised the UV data. Be the first to comment on "Astronomers View One of the Most Luminous White Dwarf Eruptions Ever Seen"